In 1951 the British psychologist William Hick conducted experiments with a series of lights and Morse code keys to measure choice reaction times. Hick discovered that the relationship between the time it took to make a decision and the number of choices was logarithmic. Together with work by the US psychologist Ray Hyman their studies formed the basis of Hick’s Law which states that the more choices you offer people the more time they require to make a decision. As a result when people are given lots to choose from have to spend a considerable amount of time to interpret and process information to make a suitable decision. Hick’s Law also corresponds with the Paradox of Choice by Barry Schwartz who argues more choice leads to more stress and reduced levels of customer satisfaction. What does Hick’s Law tell us? “RT” is the reaction time, “(n)” is the number of stimuli offered, and “a” and “b” are arbitrary measurable constants that depend on the task to be completed and the conditions under which it will be conducted. “A” could be getting an appropriate gift for your sister’s birthday and “B” could be a phone call with your mum to find out what other members of the family might be buying her as a present. The implication of Hick’s Law for UX and optimisers appears simple – minimise the number of options you display to speed up the decision-making process. There are exceptions to the rule though as if a visitor has already made up their mind before arriving on your site they will take less time to make a decision than someone who has not decided what they want. From a conversion perspective this means less is more and give more prominence to the option that is most likely to meet customer goals. But what else does Hick’s Law tell us about digital marketing? The design principle known as K.I.S.S (Keep it Short and Simple) originated from the application of Hick’s Law and this has been applied across many fields. In terms of systems design, Gall’s Law appears to apply a similar principle to the field of complex systems. This is a rule of thumb that suggests that complex systems have usually evolved from a simple system that worked. This is consistent with agile working which encourages project managers to keep website and apps simple at first. Avoid adding too many features and complex functionality at the beginning of the design process. Massive menus and lots of categories need to be avoided. Minimise call to actions (CTAs) and links on a page to reduce cognitive load. The vast majority of users who land on your site have some kind of preconception or intent about what they are looking for. Tailoring landing pages according to the source of traffic and what they are looking for can help us to remove choices that lack relevance to that particular customer segment. By eliminating distractions and focusing on the most relevant choices we can make the user experience less cognitively demanding and more enjoyable. For large data sets such as blog posts, thumbnails or product recommendations, provide structure using white space and other directional cues. By applying consistency to design this facilitates the user’s decision-making without over-powering them with choice. For content heavy sites designers should use patterns and consistency to allow users to easily scan the page and quickly find what they are looking for. A good design uses a combination of visual cues, colour, spacing and consistency to visually emphasize important conversion elements on a page. People don’t read content, they scan it. Use suitable images, graphics, spacing, headings , short paragraphs and bullet points to assist users in this process. Following established web conventions such as using blue for text links to indicate that it is clickable speeds up the user’s decision-making process. 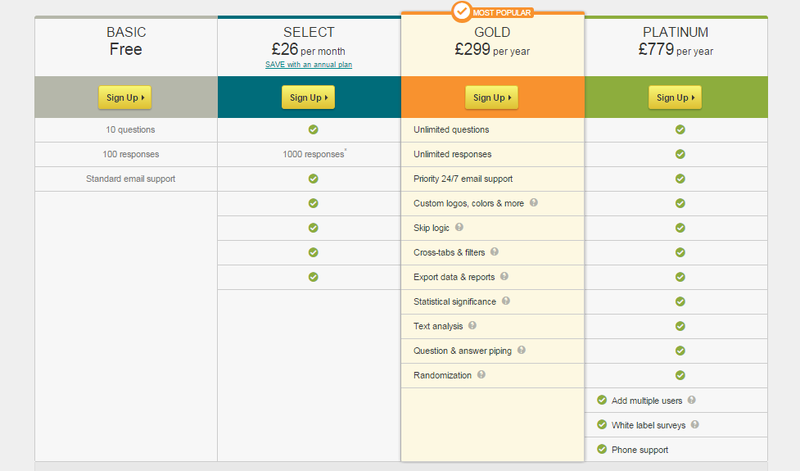 Users don’t have to think about such choices as these are globally recognised patterns in web design. 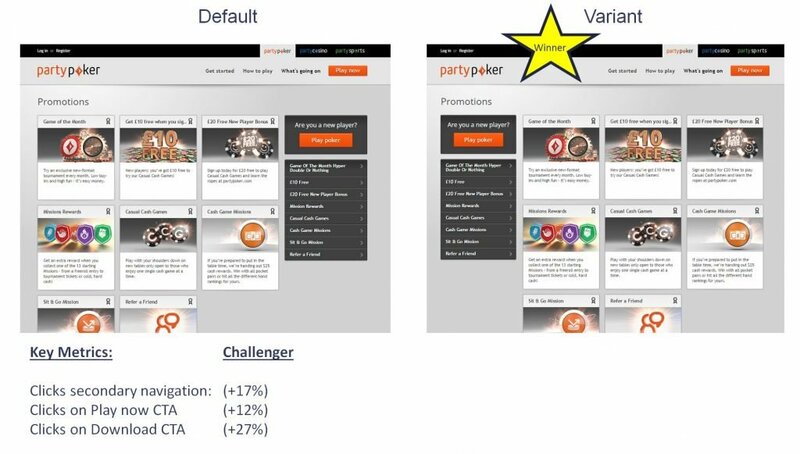 In an A/B test on partypoker.com we increased clicks on the vertical navigation by 17% by moving the navigation from the right to the left to conform to the web convention. Using standard web conventions throughout a design helps users make decisions based upon previous experience. 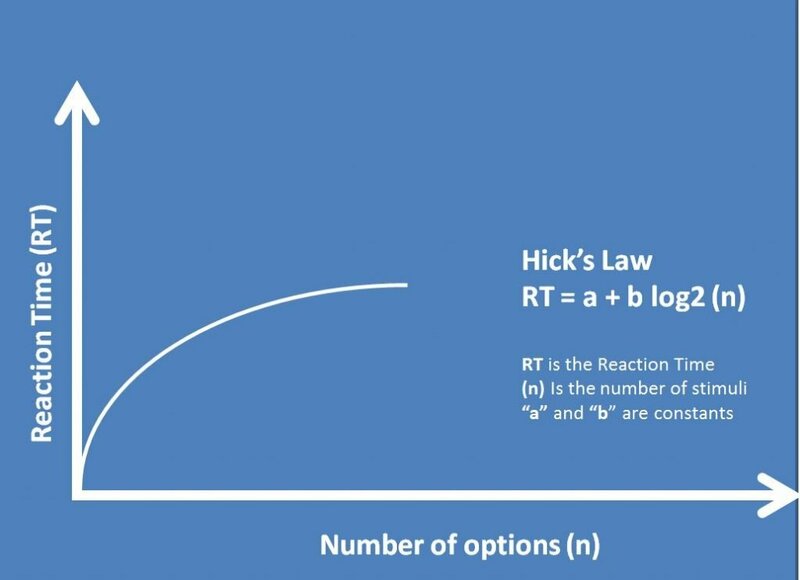 Hick’s Law reminds us that conversion rate optimisation is about focusing on core customer needs and behaviour to minimise cognitive load and make the user experience enjoyable. By delivering a consistent set of design patterns that reflect behaviour and web conventions we can minimise the number of conscious decisions users need to make and improve conversions. Design is not about making a website look beautiful or to win awards, but rather we should aim to make the user experience effortless. By applying the principles of Hick’s Law throughout the user journey we should improve the chances of prospects and customers converting. Is Survivorship Bias Destroying Your Optimisation Strategy? Was The Pepsi Ad Trying To Do The Wrong Job?